The good china is back in the cupboard for a few weeks and the debate rages on about the best weekend to get our tree (is the 2nd too early? is the 9th too late?). And of course, the holiday entertaining dates start to stack up. There are the work happy hours (two, in our dual-income household), the school Christmas Pageant, the random holiday-themed auction benefit event, the annual gingerbread house date with our best buds, the downtown decorations wander followed by pizza with the grandparents and cousins...not to mention the Big Day(s) itself: church, Christmas Eve supper, Christmas morning brunch, Christmas dinner. Each and every one of which calls for an outfit. Stylin' Mamma is (if nothing else) a busy mommy. Gone are the days when I could devote an entire afternoon to primping, from the blow-out down to the pedicure. Dressing up has become a streamlined process, crammed into the 25 minutes between when the babysitter rings the bell and the dinner reservation kicks in. Needless to say, some day-to-night planning is in order -- particularly for entertaining in the home, which we do quite a bit this time of year. 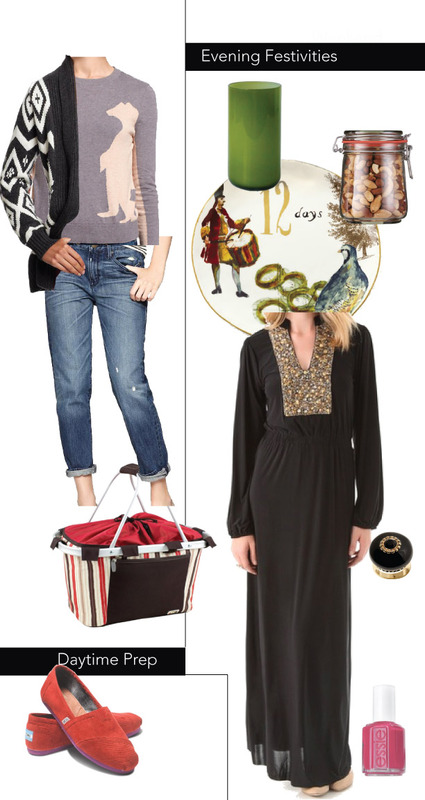 A gal needs a look that will take her to the farmer's market in the morning, withstand any stray splatter from the turkey baster in the afternoon, allow for some park time to help the kids blow off steam as the evening approaches -- and then a lightning quick-yet-elegant change-up for dinner on the good china. For day, I like a soft pair of boyfriend jeans (love the flap pockets on these! ), and because I'm always cold (you can find me on the ottoman closest to the fireplace, thank you very much), some sweater-on-sweater action: one tongue-in-cheek pullover for padding around the house , plus a cozy coat-like topper for a chilly walk to the park. Corduroy Toms add a pop of color, and a quirky cooler basket lets me carry my organic produce in style. Because we barely leave enough time to change for dinner, I like to keep dressing simple, festive, and unfussy: an easy, comfortable dress; a statement ring; and a great pedicure should do the trick. With a glass of bubbly in hand and a bowl of mixed nuts on the table, I'm ready for action.